Meet the Bagel Whizz - Great on Buns Too! Have the Bagel . . . Lose the Waist. 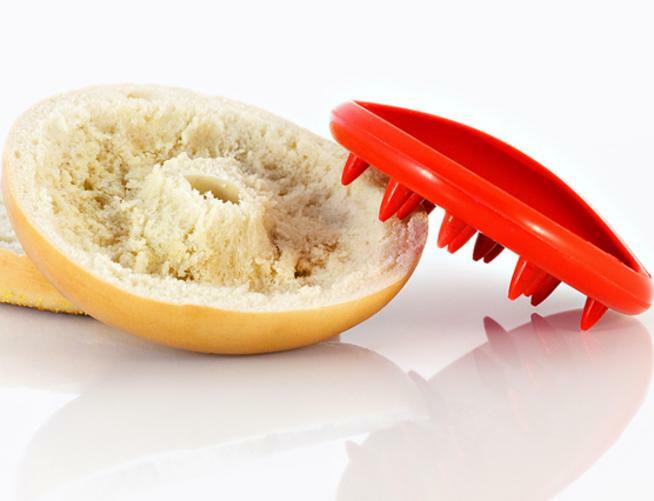 The Bagel Whizz is the first in a line of nutritional tools to help the health-conscious individual keep the great taste of their favorite bread while removing some of the filler and calories. Bagel Whizz supports the Diasabled American Veterans and also New Directions. So try our Bagel Whizz, it creates a perfect cradle so that you can fill in all of the other flavors you want to have in your healthy bagels. Many companies offer low-carb breads, bagels, and other low-carb ideas, but many of them just don’t have the flavor. These products also cost more. With the Whizz, the taste remains the same and you can keep using your personal favorite breaded items. Start carving out your carbs and lower your glycemic index by having low-glycemic snacks. Don’t let all of those heavy breads fill you up. Whizz out some carbs, and fill your meal with more protein and still keep that great breaded flavor. Copyright 2011 The Bagel Whizz: Healthy Bagels. All Rights Reserved. To order please call 888-887-1220 & Thank You for your support of Disabled Veterans!! !